The blog is busy preparing its presentations for its World Aromatics and Derivatives Conference later this month, co-organised as always with ICIS. As well as looking at the impact of the transition to the New Normal, it will be investigating the current state of benzene markets. These are always an excellent leading indicator for the global economy, and the current position is particularly significant. 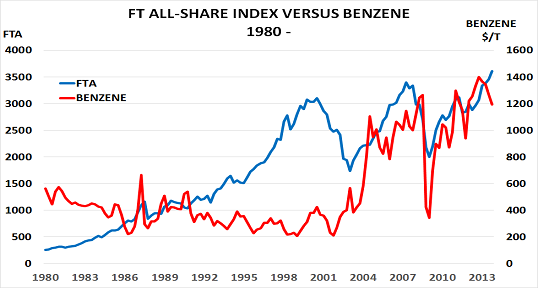 As the chart shows, there is normally little alignment between benzene prices (red) and major financial indices such as the Financial Times All-Share Index (FTA)). Both should move in line with their own supply/demand balances, and any parallels should be coincidental. What is behind this change? 10 years is clearly a long enough period to suggest that new drivers have appeared. The key is perhaps that benzene markets have lost their major sources of on-purpose production. Instead supply now depends on developments in refining and oil markets, and doesn’t adjust with changes in demand levels. Shortages and surpluses have become more obvious and longer-lasting. 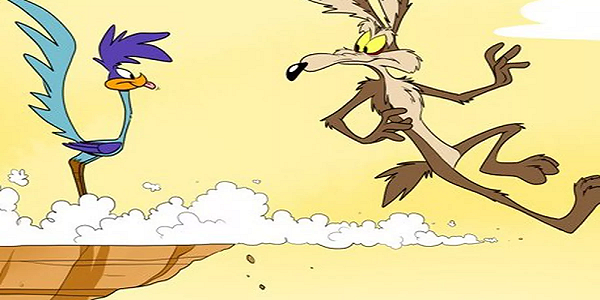 Oil markets have thus lost their role of price discovery. And in turn, this has also impacted benzene markets. Neither are now trading in line with their own fundamentals of supply and demand. Instead, they are effectively being manipulated by short-term financial flows. But these flows cannot continue forever, of course. What happens next is the question the blog will aim to answer in Brussels.